A Free Webinar, Coupon and a Special Gift! 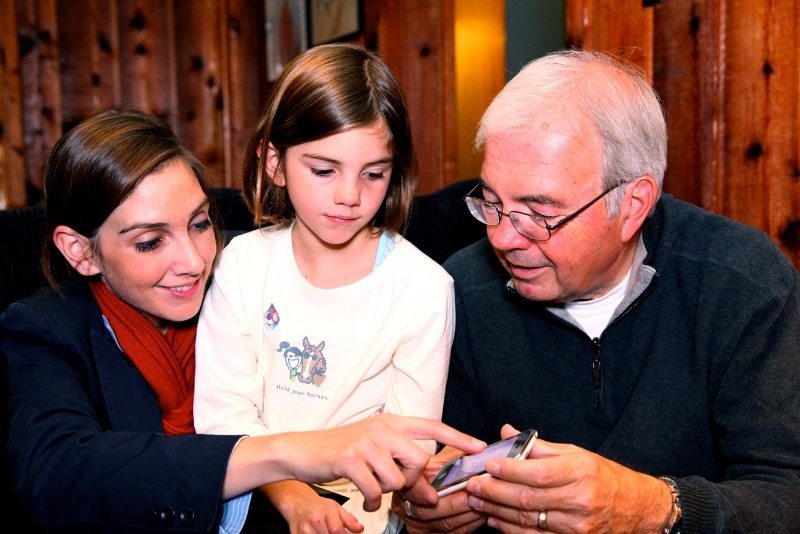 On Wednesday, November 6, 2013, at 7:30 pm Central (8:30 pm Eastern), Saving Memories Forever will present a free webinar, Preserving Your Family’s Oral History and Stories. Click here to register today! BONUS: If you sign up for our mailing list during the registration process, once the webinar is over you’ll receive a special Saving Memories Forever coupon as well as a special gift: a copy of the new e-book Preserving Your Family’s Oral History and Stories. The Preserving Your Family’s Oral History and Stories webinar will provide you with all the information on the latest methods and tools used to capture and preserve those family stories. In addition, once you've learned how it easy it is to build a family archive of stories, you’ll want to share them with others using the tips and tricks shared during this webinar. The webinar will be presented by one of the leading presenters of genealogy and family history webinars: Thomas MacEntee. Thomas is the founder of GeneaBloggers.com, a community of over 3,000 family history bloggers around the world, and a nationally-known genealogy professional, author, speaker and educator. We’ll be recording this webinar and posting it at the Saving Memories Forever website so you’ll be able to learn all the valuable tips and tricks to preserving your family’s special memories. If you need a little extra help getting started with Heritage Collector Storybook, come join in our free users group meetings. Held most Tuesday evenings. The format of these webinars will be unstructured, and very informal. We want you to feel comfortable and stress free! Come prepared to get some ideas, tips and tricks on how to use the Storybook and Calendar modules. Please share your ideas, and come with your questions. There will be free gifts at each of the Classes. The class will be held tomorrow night 10/29/2013 at 9pm MST. We will be showing you how to make a kitchen magnetic calendar. Also, we are getting ready to schedule our next set of users group meetings for November. Please give us your feedback on things you would like us to demonstrate and discuss. The Illinois State Genealogical Society (ISGS) is happy to announce the continuation of its popular monthly webinar program in 2014. The 2014 ISGS Webinar Series would not be possible without the generous contributions received throughout 2013 and sponsorship provided by FamilySearch. Registration for the 2014 webinars is now open! You’ll find a fantastic lineup of presentations and speakers and we hope you will join us for a wonderful educational experience. The ISGS webinars, which are live lectures/presentations that you can attend via a computer with an internet connection, are held as a live broadcast on the second Tuesday of each month at 8:00 PM Central. The live broadcast of our webinars are free to the public. ISGS members who are unable to attend the live broadcast are able to access recordings of all past webinars through the Members Section of the ISGS website, to watch at their convenience. So what does 2014 have in store? Here is our amazing lineup! And don't forget to spread the word! Forward this email onto your friends and colleagues, post the information to social media sites and/or your blog/website, or print out a few copies of our webinar flyer to hand out at your local society meetings. The flyer for the 2014 series can be accessed at http://bit.ly/isgs2014webinars. Again, a big thank-you to all of the webinar donation fund contributors and to FamilySearch for sponsoring the entire 2014 webinar series! We couldn't do it without you!! Just 8 weeks in and I have to say the support and interest in the Book of Me has been breathtaking. The Facebook group has been a true source of amazement and engagement. It is wonderfully refreshing to see a group of relative strangers come together, across the many miles and time zones to share their stories, listen to stories and be part of something very thought provoking. On the back of the Facebook group I decided to undertake a couple of trials. A video to accompany the prompts, which started with week 3. I was asked if I could produce one each week and so far I have, either in the format of me talking or a presentation style, which I think is my preference, as it means that I can prepare them in my pajamas! A fortnightly hangout on air. - These have been fairly well supported. Mr Google is my new best friend, well after several fellow genealogists, who did some hand holding - you know who you are, so thank you! Through Google we can tap into the facilities of Communities and YouTube. This is where you can watch live or view later when it is convenient. The hangouts are going to be a regular feature - every fortnight. Depending on my schedule the day may vary, but I quite like Tuesday's! Use World Time Buddy to see the time in your region. The son and grandson of Army veterans, Russell Horton is the Reference & Outreach Archivist at the Wisconsin Veterans Museum. He earned his undergraduate degree in history from the University of Wisconsin-Madison and master’s degrees in history and library science from the University of Wisconsin-Milwaukee. He is also the author of an award-winning article, “Unwanted in a White Man’s War: the Civil War Service of the Green Bay Tribes.” Russ began working at the WVM as a graduate student in 2001 and has worn many hats, processing manuscripts and cataloging objects before accepting his current position in 2008. He helps researchers ranging from genealogists to professional historians learn about the stories and sacrifices of Wisconsin veterans. Do you have military ancestors in your family and don't know where to begin to look for information on them? The Wisconsin Veteran's Museum and Archives have many resources that can help point you in the right direction, including much on the Civil War, World War I and II and more. Come listen to Russ as he shares all of the jewels and gems of their collection and how it might be able to help you with your genealogical research. After registering, you will receive an email with information and a link to join us the night of the webinar and handout information. Join us on Tuesday, November 12, at 8:00 PM Central, when Diana Crisman Smith, will present, Little Houses on the Prairie: Midwestern Research Techniques. To attend this webinar, register at https://attendee.gotowebinar.com/register/848493470127452672. Last week's webinar, Up In Smoke!! What To Do When the Courthouse Burns, presented by Peggy Clemens Lauritzen, is now available to ISGS members in the Members Section of the ISGS website (http://ilgensoc.org/members.php). Coming in 2014: In a little over a week, we will announce the 2014 schedule. We have some great presentations in store for you. Stay tuned! For the complete list of upcoming webinars, visit http://ilgensoc.org/cpage.php?pt=234. Yearning to “read all about it?” Newspapers are a fantastic source of research leads, information and historical context for your family history. 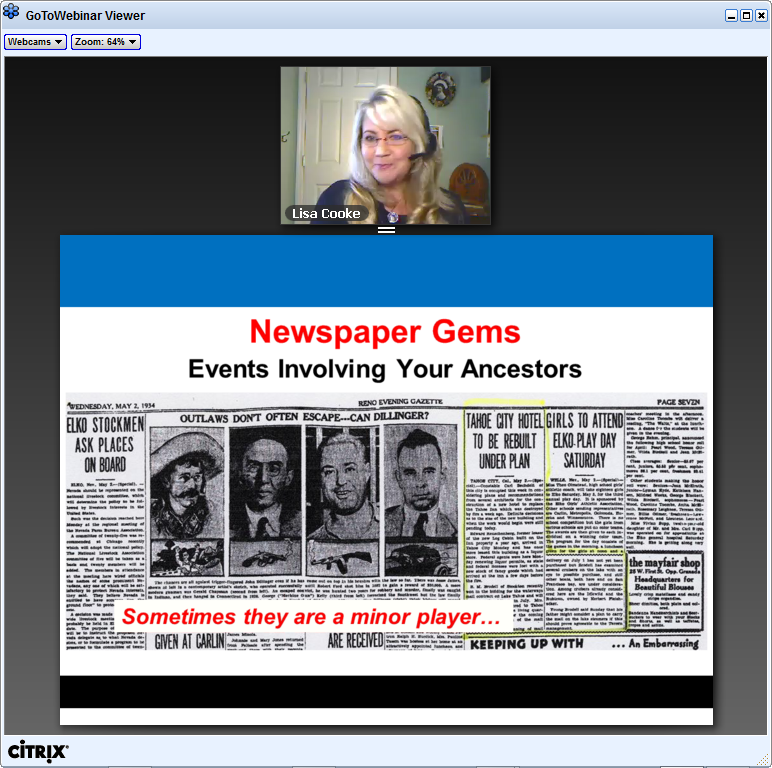 In this webinar, presented byGenealogy Gem's Lisa Louise Cooke, learn the specialized approach that is required to achieve success in locating the news on your ancestors. Includes 3 Cool Tech Tools that will get you started. Join us for the live webinar Wednesday, October 16, 2013 at 2pm Eastern U.S. Register today to reserve your virtual seat. Registration is free but space is limited to the first 1,000 people to join that day. Before joining, please visit www.java.com to ensure you have the latest version of Java which our webinar software requires. When you join, if you receive a message that the webinar is full, you know we've reached the 1,000 limit, so we invite you to view the recording which should be published to the webinar archives within an hour or two of the event's conclusion. Lisa Louise Cooke is the owner of Genealogy Gems, a genealogy and family history multi-media company. She is Producer and Host of the Genealogy Gems Podcast, the popular online genealogy audio show as well as the Family History: Genealogy Made Easy podcast, both available at www.GenealogyGems.com, in iTunes, and through the Genealogy Gems app, and free toolbar. Her podcasts bring genealogy news, research strategies, expert interviews and inspiration to genealogists in 75 countries around the world. Lisa’s offerings are not limited to online. She is a sought after international genealogy speaker, and produces live presentations of The Genealogy Gems Podcast at top genealogy conferences.